Yup, you're seeing right. I'm posting a recipe on my nail blog. Why? Well, these are the most amazing cupcakes I've ever tasted in my life, and the best part is, they're vegan!! Sure, they aren't the healthiest for you, but they're healthier than the cinnabun cake I was going to make which called for 2 and 1/2 sticks of butter. The only thing that makes this recipe vegan is that instead of using buttermilk, they use a mixture of rice milk/vinegar to make an equivalent of buttermilk. See the note in the recipe if you want more info on this. Not only is baking vegan healthier, to me, it's ten times easier than cracking open the eggs and all that jazz. Plus, they're free of the most common allergens of dairy, peanuts, tree nuts, and eggs, which is an added plus for those with allergies. Everyone who I have ever baked a vegan recipe for before has NEVER known the difference until I told them. I always wait to see the reaction, then go "So, can you tell those are vegan?" My chocolate chip cookies are the bomb, just saying. Please excuse the photo, it is a webcam shot since my camera is dead as a doorknob and I was too lazy to charge it. Plus, by the time it's charged, I think these will be gone :). I credit Pinterest with this recipe. Sadly, the link which the recipe led me to had no author or anything, but whoever originally made them, you're awesome. Preheat oven to 350. line a cupcake pan with paper liners or spray each cavity with a baking spray. Combine all remaining wet ingredients to the buttermilk mixture. Mix together both wet and dry ingredients until they form a smooth batter. Pour batter into cupcake tins. In a small bowl, add all the topping ingredients together and mix. Top the batter with 1/2 teaspoonful of the topping mixture. With a toothpick, swirl the mixture into the batter. Bake for 19 minutes (longer depending on oven) or until toothpick comes out clean. If you want, you can make a vanilla frosting for the top, or buy one, whichever is easiest. I do not think they need them and prefer them without it. Let me know if you try them!!!! Would you like more recipes or for me to stick to the nails?! Cupcakes! 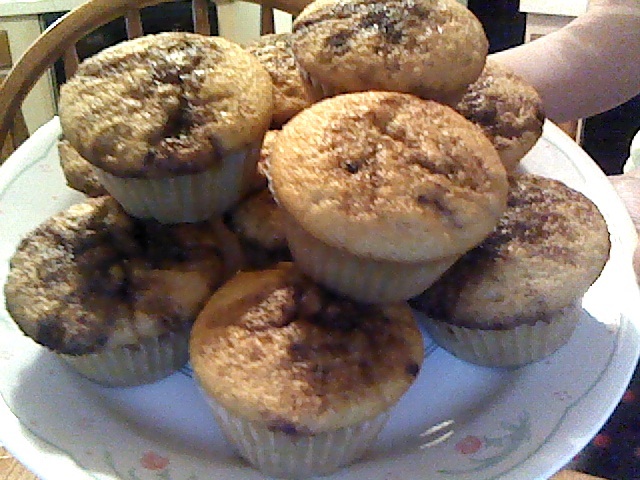 And snickerdoodle cupcakes no less, how awesome!